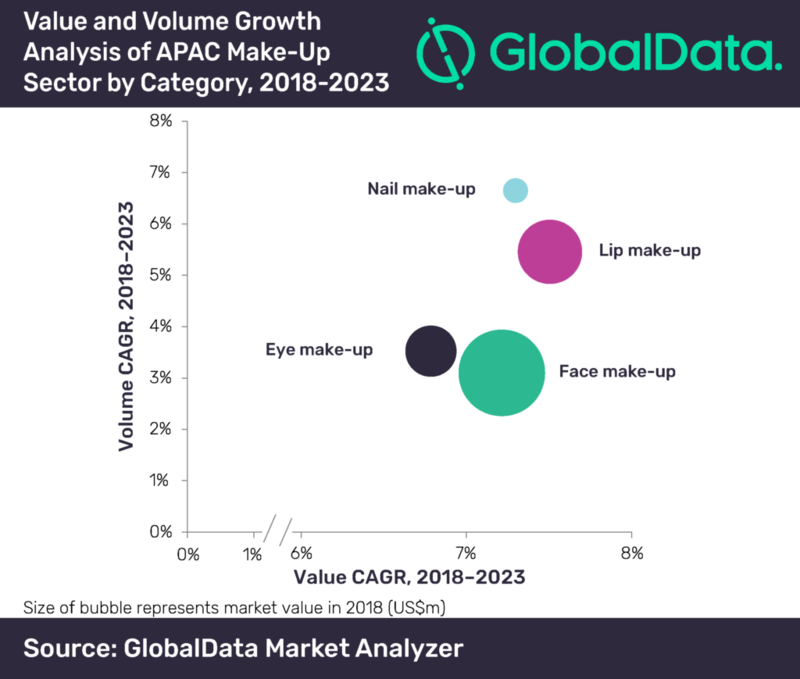 Driven by increasing number of women in workforce and growing spending power of consumers, the Asia-Pacific (APAC) market for make-up products is forecast to surpass US$21bn by 2023. The region will also record the fastest growth in both value and volume terms at compound annual growth rates (CAGRs) of 7.2% and 4.4%, respectively, during 2018–2023, says GlobalData, a leading data and analytics company. According to the company’s report, ‘Opportunities in the Asia-Pacific Make-up Sector: Analysis of Opportunities Offered by High-Growth Economies’, growth in the APAC make-up market is mainly driven by growing economies such as India and China, which are projected to register double digit growth during the forecast period. On the other hand, Japan continues to be the largest market with a share of 36.3% in 2018, followed by China with 27.9%. According to the company’s unique scoring system, which involves risk-reward analysis of 12 major economies in the APAC region, Hong Kong, China, South Korea and Australia are the high-potential countries. In terms of categories, face make-up enjoys the majority share while lip make-up is forecast to register the fastest growth, in value terms, during the next five years. Per capita expenditure on face make-up products in APAC was US$2.3 in 2018, the highest compared to other categories, followed by lip make-up with US$1.3. This is substantiated by the company’s 2018 Q3 consumer survey, where 62% of consumers from Asia & Australasia stated that ‘how well the products are aligned to their time and money constraints’ is always/often an influential factor when choosing beauty and grooming products. Manufacturers are therefore launching time-saving products that are easy and quick to use. L`Oreal S.A. leads the APAC make-up sector, followed by Shiseido Company, Ltd. and Kao Corporation. Maybelline is the leading brand in the eye make-up and lip make-up categories, while Kanebo and Revlon lead face make-up and nail make-up categories, respectively.